40 Peter Holsapple / Chris Stamey - "Angels"
Bonita canción que ahora se ha visto reeditada. 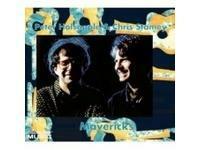 Mavericks, the 1991 duo album by Peter Holsapple and Chris Stamey (members of the dB's in the early '80s), will be reissued on January 15, 2008 on Collectors' Choice Music. The re- mastered new version of the album will contain six previously unreleased tracks. Holsapple and Stamey produced the album themselves and welcomed several guest musicians of note: Jane Scarpantoni, (Tiny Lights, Bruce Springsteen, R.E.M. ), Chris Butler (The Waitresses and veteran producer), Gene Holder (The dB's), Dave Schramm (The Schramms), Ilene Markell (7 Deadly 5, Wednesday Week) and Michael Blair (Tom Waits). “Mavericks is the product of an old friendship having new parameters," says Holsapple. “Chris and I have worked together since we were teenagers, and this album is certainly one of the finest we've ever made. In part due to its comparative placidity (compared to a dB's record, that is) and also its lyrical maturity, Mavericks is rightly considered an acoustic rock treasure by lots of people. I have always loved the buoyant harmonies and intriguing arrangement moves throughout this record. Stripped of the powerhouse rhythm section of the dB's, Chris' and my songs and vocals retain their strength; the album is a quiet gem, not without its rockers, but focusing on the more intimate and peaceful side of our writing." The core album contains 12 tracks. The two best known are the lead track, “Angels," and the Holsapple song “She Was the One." Eleven of the songs are originals and one ("Here Without You") was penned by Gene Clark and originally recorded by the Byrds. Other tracks of note include Stamey's “Geometry" and “I Want to Break Your Heart," as well as Holsapple's “Anymore." The Collectors' Choice reissue of Mavericks adds six previously unreleased bonus tracks: the original version of “Angels," plus “Hollywood Waltz" (bringing the album's total number of waltzes to two), a more ornate arrangement of “Close Your Eyes," an acoustic remix of “Here Without You," an electric remix of “Anymore" and an instrumental, “I Knew You Would." Holsapple and Stamey are at work on a long-awaited “sequel" duo album titled Here & Now, due for release in 2008.